Let’s face it whether you see a skunk or smell a skunk the encounter is an unpleasant nose turning experience for most people. 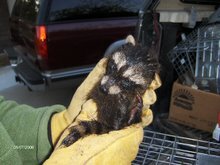 I have made a living out of trapping and relocating skunks and a host of other animals, such as raccoons, opossum, rats and mice, from property in the Farmington/Farmington Hills and surrounding areas. I can honesty tell you that there are exponentially more skunks than imaginable prowling our neighborhoods. Now, I don’t necessarily mind removing the animals for you because when you smell the odor of a skunk all I smell is the aroma of money. There are a few simple tactics in removing skunks from you property. The first is to remove all food sources. Many people when they look at their lawns believe that they have mole problems, but in fact, many times they have skunk problems. Skunks can relentlessly tear up a lawn looking for grubs, which can easily be mistaken for moles tunnels and pop ups. Regardless if you believe it is moles or skunks, the first thing I recommend is to have your lawn checked and/or treated for grubs. Secondly, I recommend taking your garbage out to the street the morning of garbage pick up days. Skunks are nocturnal creature’s typically venturing out between 11:00 PM and 5:00 AM. Skunks are primarily carnivores and will eat anything that smells like rotting meat such as steak, chicken, hot dogs, etc… By waiting until the morning you remove an additional potentially tasty food source for the skunks as well as other varmints. Additionally, skunks and opossum will take over ground hog holes for their dens. Fill in all holes in your yard that may have been used by a ground hog or any holes that are large enough to allow a large house cat to enter. You may have to keep filling the same hole for a couple of days, but eventually the skunk will tire of re-digging his sleeping quarters each morning and will move on to an easier location to bed down. Low laying decks are the skunk’s favorite bedding location. It offers a safe and warm location away from dogs, people and other predators who wish to harm them. You can deter skunks by barricading the outer perimeter of your deck with decorative block or wood. Skunks are inherently lazy and will not bother themselves with digging under the blocks to get to a bed site. Lastly, you can go to your local hardware store and purchase a live trap (Average Price about $45.00) large enough for a skunk, bait it accordingly, and wait for your skunk to be trapped. There is no greater feeling when you trap the animal that has caused your nose to turn. The problem comes after the animal is trapped— NOW WHAT! Well I can’t help you with that, you can drive it far away from your property and release it back into the wild…but be careful, they can become very edgy by the time you open the trap to freedom. I won’t recommend transporting live skunks in trunks of cars for obvious reasons; use a pickup truck without a cap. Oh, by the way when trapping for skunks, don’t let you dog out of the house in morning to do its duty. I can almost guarantee that they will go right up to the cage of the trapped skunk and more than likely your one problem will double. The following recipe works well when you or a pet are sprayed during a skunk encounter. Mix quart of hydrogen peroxide with a cup of baking powder and a tablespoon of Dawn dish soap in a bucket. Stir until thoroughly combined and wash yourself/pet liberally. This is not 100 percent, but it seems to work fairly well. The trick is not to allow yourself or pets to get sprayed in the first place. If you are wondering, I have never been sprayed. If you still have issues with a skunk and would like to have professional come out and review your situation, make sure they are insured and licensed with the Department of Natural Resources. There are a number of company’s that will take care of trapping and removing animals, do your homework and make sure you know what are all of the costs associated with the services and if there are any guarantees.